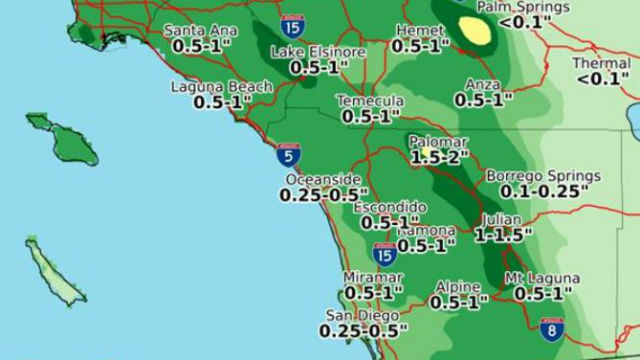 A storm system sweeping into San Diego County late Friday could bring rain through the weekend, National Weather Service forecasters said. The Pacific storm system is expected to weaken as it makes way inland, but will have enough moisture to drop showers beginning late Friday evening and continuing through at least Saturday evening. A slight chance of showers will linger in the region through Sunday evening. Rainfall totals from the weekend storm will range from a quarter-inch to a half-inch in coastal and inland-valley areas, around one-tenth of an inch in most desert areas and anywhere from a half-inch to an inch in the county mountains, according to the weather service. Snow levels will drop to 7,000 feet by Sunday. Strong and gusty winds will develop in the mountains and deserts on Saturday and continue through Saturday night. Dry weather is expected on Monday before another storm system brings a chance of precipitation Tuesday through Thursday, forecasters said.